Study Abroad Summer 2017 Faculty Led Programs–Applications due Feb. 1. These are 2-5 week study abroad programs over summer break with automatic Illinois credit. This could be a great way to manage both study abroad and taking the LSAT. For a list of available courses and application materials, visit the study abroad website here. The Office of Undergraduate Research (OUR) is now accepting submissions for the 2017 Undergraduate Research Symposium (URS), set for Thursday, April 27.Deadline for submitting an application to the URS is Wednesday, February 1, 2017, at 11:59 pm. The application can be found at: http://go.illinois.edu/urs2017 For more information on Undergraduate Research Week, the URS, and OUR programs, please visit our website at: http://undergradresearch.illinois.edu/ Questions may be addressed to ugresearch@illinois.edu; please put “URS Application” in the subject line. LAS 101 Internship applications are due Feb. 6. Check out their application website here. Are you taking the LSAT this year? Try to plan ahead! When will you take the LSAT? For more information on the specific dates the tests are offered, please visit the LSAC website. Keep in mind that you want to give yourself enough time to apply, write your personal statements, and double check your applications. Doing all this all at the last minute is not a good idea. There are a lot of different components that go into an application. How will you study? What resources will you use? Some students buy books and study on their own while other students choose to take a LSAT prep course. Come learn more about different test prep companies and their courses! Find the best one for you! 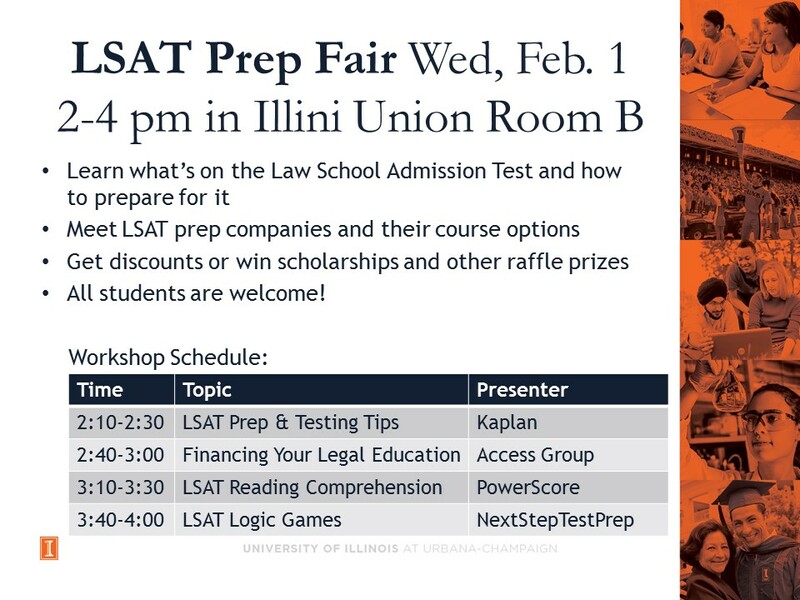 The LSAT PREP FAIR is Wednesday February 1st from 2:00PM-4:00PM in Illini Union Rooms B&C. June LSAT takers – keep an eye out for sign-ups for our June 2017 LSAT on-campus study groups. Sign-ups will be coming out in the next few weeks. Make sure you are studying for the LSAT when you have time to commit to it. If studying during the school year, try to be reasonable with the classes you are taking. You do not want to be taking the hardest classes of college and study for the LSAT at the same time. If you plan to study over the summer, make a schedule early so you know how to balance summer break with LSAT studying in a productive way. Some testing centers fill up quicker than others. Sign up early so you can test at your preferred location. If you are taking the June 2017 LSAT, sign up early! Typically, this test fills up by spring break. Some students decide to go home to take the LSAT, but some students feel more comfortable taking the LSAT on campus. Pick your preferred location for test day. The LSAT is not a cheap test. Currently, the cost for the LSAT is $180 per test. Late registration adds $90 to the base cost. Signing up early is important. Some students are eligible for fee waivers. For more information to go to the LSAC website. The basic criterion for receiving a waiver is the absolute inability to pay. Because the cost of these services is only a fraction of the cost of a legal education, the need criterion is considerably more stringent than for other financial aid processes. Only those with extreme need should apply. Planning ahead is the best way to prepare for LSAT! 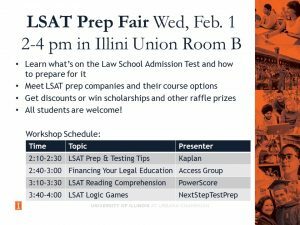 LSAT Prep Fair is February 1! The PLAS-sponsored LSAT Test Prep Company Fair is set for Wednesday, February 1, 2017, 2:00-4:00pm, Illini Union Rooms B&C! This event is a chance to learn more about several commercial LSAT test prep companies, participate in informative mini-workshops conducted by the companies and win discounts on test prep materials and scholarships for courses! To find out who is coming and see the workshop schedule, keep checking the PLAS website for updates on the fair. *Note: Pre-Law Advising Services does not endorse any commercial LSAT test prep company. Get a feel for the real Law School Admission Test by taking this practice exam! This timed practice LSAT will be offered in a structured classroom-style environment with a proctor. The exam will feature four sections plus an optional writing section at the end. Students with no LSAT experience can get a baseline score, and students prepping for June will assess their preparation needs. Please register at the link above. Location and other details will be sent to registrants. Special thanks to the Law School Admission Council for granting a license to utilize the LSAT for this practice exam. To register, follow this link. The Illini Union is hosting the Winter Week of Welcome featuring all kinds of fun events this week. Check out the listing here, and mark your calendars for the RSO Involvement Fair on Wednesday, January 25! Interested in working on campus? You won’t want to miss the Career Center’s Opportunities Fair, on Tuesday, January 24, 5:00-6:30pm, at the Career Center. Visit with campus units that are hiring students for part-time jobs and internships. This is your chance to build your resume, enhance your Illinois experience, and learn more about The Career Center and various campus departments! Undergrad PAID Internship at UIUC in Bio-Humanities for 2017-2018 Applications due March 1, 2017! Are you a bio-engineering or life science major interested in philosophy, politics, history, and literature? Are you a humanities major who also dabbles in biochemistry, molecular biology, neuroscience or endocrinology? Are you interested in how the sciences and the humanities are generating new areas of research together? The Illinois Program for Research in the Humanities (IPRH) is looking for undergraduate interns to work with its Bio-humanities research group for the academic year 2017-2018. The research group seeks three undergraduate interns who will work with the group on their seminars, workshops and programs. Interns will also work with the research group director to develop their own research projects as well as a research symposium for undergraduates at the end of the spring semester. Interns will work approximately 10-11 hours per week, paid at the rate of $15.75 per hours, and will have $600 to support their research. Applicants must be juniors or seniors the year of the internship. For more information, go here. Please address questions to: Dr. Nancy Castro, at ncastro@illinois.edu. The Nuclear Energy Institute (NEI) in Washington, D.C., has a number of openings for paid interns beginning in the summer of 2017. The Nuclear Energy Institute (www.nei.org) is the policy organization of the nuclear energy and technologies industry and participates in both the national and global policy-making process. NEIs mission is to ensure the implementation of policies that promote the beneficial uses of nuclear energy and technologies in the United States and around the world. To that end, NEI works to establish unified industry positions on the regulatory aspects of generic operational and technical issues. NEI’s members include all entities licensed to operate commercial nuclear power plants in the United States, nuclear plant designers, architect/engineering firms, fuel fabrication facilities, nuclear materials licensees, and other organizations and entities involved in the nuclear energy industry. Interns at NEI will work with seasoned nuclear professionals in one of the following areas: technical, communications, policy development, government relations, legal, and member relations and corporate services on issues critical to the industry. Descriptions on each area are below. Internships are 10 weeks and take place during the summer. Interns will be paid $15.00 an hour. Applications are being accepted for review between December 15, 2016 and January 31, 2017. Applications submitted beyond January 31, 2017 may be reviewed and accepted on a rolling basis thereafter. Click on this link for more information. https://www.nei.org/About-NEI/Employment-at-NEI/Internships. If you have additional questions about NEI’s Internship Program, please contact the NEI Human Resources Department at resumes@nei.org. Indiana University Maurer School of Law is hosting a Diversity Law Day. Throughout the day you will have the opportunity to network with professors, current law school students, and practicing attorneys. You will participate in a mock class taught by an Indiana Law professor and be introduced to thinking critically in a special session (and receive your own book). The purpose of this day is to help you experience the study of law and expose you to the legal profession. The Diversity Law Day is Saturday, February 18 from 9am – 3pm at Indiana University Maurer School of Law. Breakfast and Lunch will be served. To register: follow this link. As we first mentioned in several of our fall blog posts, many law schools host open houses for prospective applicants and all law schools strongly encourage students to visit their campuses. Note: spring semester is a time when many law schools will host events specifically for admitted students. Make sure you check the law school websites to see what types of events the schools in which you have an interest are offering. Listed below are upcoming events for two Illinois law schools. Chicago Kent Law School Open House, Saturday, January 28, 9:00am-2:00pm. For more information or to register, go here. John Marshall Law School Open House, Saturday, January 28, 9:00am-Noon. For more information or to register, go here. It’s January — Submit Your Applications ASAP! If you are applying to law school this cycle and do not have your applications in, get them in ASAP! Remember: this is a rolling admissions process! What is your hold up? Personal Statement: If you are struggling with drafting your personal statement, get cracking! Not sure how to get started? Check out our “Perfecting Your Personal Statement” video on the PLAS Compass page. You can also look at our tips both on Compass and the PLAS website. Once you have a draft, you are welcome to contact the PLAS office at (217) 333-9669 to set up an appointment with an advisor to go over your personal statement. REMEMBER: you need to submit your draft personal statement 2 business days prior to your appointment! Addendum: If you have to submit an addendum to explain something related to a character and fitness disclosure or to explain something else in your application, just sit down and write it! No amount of hand wringing is going to change a law school’s requirement that you submit this. Not sure how to begin? First — Check out the PLAS website to help you get started. Next — Go to the PLAS Compass page for more specific advice. Both the “Perfecting Your Personal Statement” and “Character and Fitness” videos (found within the “Application Pointers” section) provide information to help you decide how to craft this document. Once you have a good draft, feel free to make an appointment with a pre-law advisor to discuss it. We have the same policy for a written addendum as we do for the personal statement: submit your draft 2 business days prior to your appointment. Letters of Recommendation: Have your letter writers turned in your letters? If not, you should gently remind them that you need letters submitted to LSAC before the law schools that require LORs will review your applications. If you haven’t yet asked for letters of recommendation ASK TODAY! Transcripts: You need to submit your request for your most recent UIUC transcript to be submitted to your LSAC-CAS account. Here is a link to the UIUC Registrar’s Office and to LSAC’s explanation of transcripts. Note: if you have already submitted your applications, you still are obligated to submit an updated transcript to LSAC as part of your continuing obligation to disclose new information and supply updates to your file. Go here for information on this requirement. Welcome back to spring semester! LOTS of excellent opportunities are coming up, including the Illini Union Winter Week of Welcome, campus events honoring MLK Day, paid internships, scholarships and the PLAS LSAT Test Prep Essay Contest – application deadline NEXT MONDAY, January 23 – so be sure to give this week’s blog a read. 2 Ways to Win an LSAT Test Prep Scholarship! (1) The PLAS-sponsored LSAT Test Prep Company Fair is set for Wednesday, February 1, 2017, 2:00-:004pm, Illini Union Rooms B&C! This event is a chance to learn more about several commercial LSAT test prep companies, participate in informative mini-workshops conducted by the companies and win discounts on test prep materials and scholarships for courses! To find out who is coming and see the workshop schedule, keep checking the PLAS website for updates on the fair. (2) LSAT Test Prep Essay Scholarship Contest – Entries DUE NEXT Monday, January 23 at NOON! Submit your resume and essay to Judy Argentieri via email only at jargenti@illinois.edu by NEXT MONDAY, January 23, at NOON. UIUC is hosting many events to celebrate the life of civil rights leader Martin Luther King Jr. Click on the following link to find out more. http://www.diversity.illinois.edu/mlk/calendar.html. UIUC College of Law needs students to evaluate their new website! The UIUC College of Law (COL) is about to launch a new website. They are looking for student volunteer to conduct user testing. The purpose of user testing will be to determine the effectiveness of the new site for our key audiences. The COL would also like to gather candid feedback and first impressions and of course identify any development bugs that need to be addressed. Interested students do not need to have any familiarity with the current COL site, and they do not need to be committed to applying to or attending the law school here. A small token gift of appreciation will be provided to anyone who elects to participate. The test will take place at the COL building this week, on either 1/19 or 1/20, and will take no more than fifteen minutes. If you are interested in helping out, contact Krista Gaedtke, Director of Communications, UIUC College of Law, kgaedtke@illinois.edu. The Office of Undergraduate Research (OUR) is now accepting submissions for the 2017 Undergraduate Research Symposium (URS), set for Thursday, April 27. The URS is the signature event of Undergraduate Research Week (April 23-29), and brings together students, faculty, and staff from all disciplines on the University of Illinois at Urbana-Champaign campus, as well as corporate partners and sponsors, to learn more about undergraduate research and its potential to change the world. Students are encouraged to apply even if titles or abstracts have not yet been finalized – they can be edited. Just make sure the application is successfully submitted by February 1! The Office of Undergraduate Research announces its Spring 2017 calendar for the Getting Started in Research Workshop! During the workshop, we will discuss the various forms of undergraduate research that take place on campus, guide students to develop a plan of action to locate research opportunities on campus, and discuss ways to contact faculty research mentors. Students will leave the workshop with (1) a better understanding of undergraduate research and how it takes place on our campus, (2) increased confidence to contact faculty research mentors, and (3) a list of faculty mentors to contact. For additional workshop dates, registration, and more details please visit the Office of Undergraduate Research website. DePaul University College of Law Open House, Saturday, January 21, 10:00am. For more information and to register, go here.